We met Monica and had a drink late yesterday in the Plaza Mayor. V and I then headed back to the hotel with take-away in hand. She hadn’t had sushi before – she’s now a convert. Today started well. 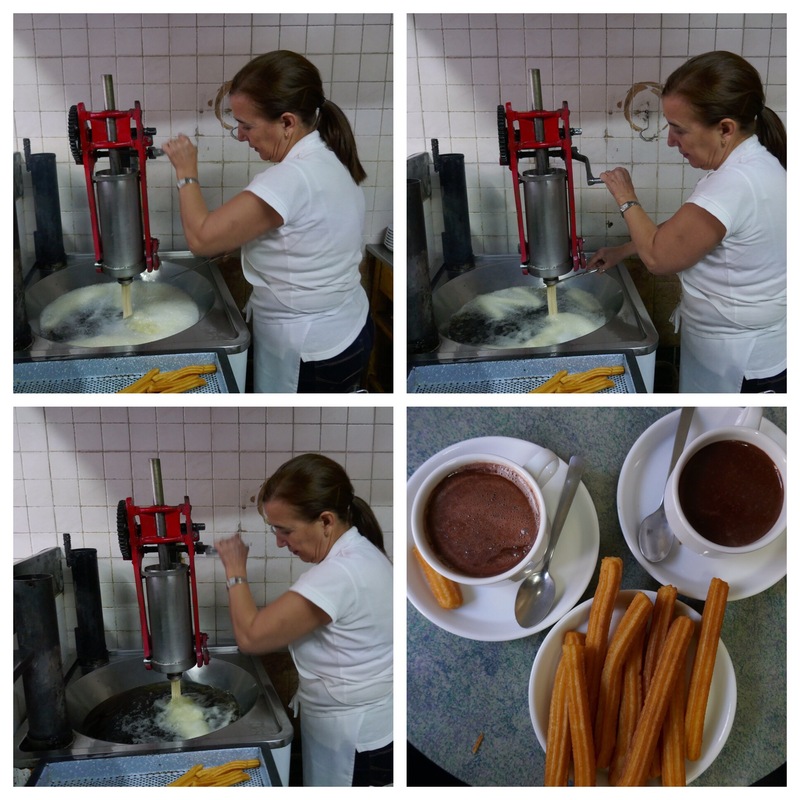 There is a very nice churrería near the hotel, small, busy, and very unpretentious. Great chocolate and churros. I wanted a book of spanish verbs (yes, another) and V needed some warmer clothes for her next stage towards Santiago. We did it all. Even did a bit of touristing: looked into la casa de las conchas, the new cathedral, the interesting round church, San Marcos, up the far end of Calle Zamora, and I can’t remember what else. Tomorrow is a holiday, like the day of the dead in Mexico (El Dia Del Muertos; here: Dia De Los Santos). It’s also apparently halloween. (Hmmm, um, who cares). So, sigh. Of more interest to me, everything will be shut except for bars and restaurants. Fingers crossed my lovely friend with a bar around the corner is open and I’m planning a very lazy day and time in the bath anyhow. V will leave early tomorrow, Wednesday, possibly in the dark, as there may be trouble getting a bed tomorrow in her next town. You can’t tell as there’ve been some days with 1 peregrino and others with up to 15. October is a quieter time of year for VdlP and just bad luck if you end up arriving with lots of others. We know of an Aussie guy heading off tomorrow too. A friend of Monica, he apparently has a painful achilles tendon problem. Others? No idea. V has been a wonderful friend. Infinitely patient with my murdering, and sometimes brutal, spanglish, an immense help in improving my facility and confidence with the language. Being with a spaniard also helps as she understands subtleties and the niceties I sometimes don’t. So much more than that, she is so easy to travel with. We like enough of the same things and have similar ways of operating so that being with her has been so easy and has increased my enjoyment of this walk immensely. It was really so much more fun, like my time with the boys last year and, with Benedo this year for our first week from Granada. In the end I’ve spent over a month living closely with from one to three spaniards and it’s truly enhanced my enjoyment incredibly. I have been so lucky. Over a month and I’ve still hardly spoken english, just written it. I’m getting so confused I had to ask Monica (French) yesterday for the word ‘sushi’! Yes, I know, technically it’s not an english word but, you also know what I mean. l owe a lot to my friends Victoria, Manolo and Benedo. Very good friends and wonderful walking companions. Hi Val, me siento muy afortunada de haber compartido esta parte del Camino contigo. Tanto tú como Manuel y Benedo me habéis enseñado lo que significa ser”peregrin@”, siempre dispuestos a ayudar, siempre animandome a vencer mis miedos y limitaciones… para siempre hacer el Camino ¡CON ALEGRIA! por muy duras que puedan parecer las adversidades. Val solo puedo estar agradecida por todo cuanto me has dado en todo este tiempo compartido. Eres una gran persona llena de valores que admiro, una persona llena de fortaleza y determinación, una persona apasionada por aprender, apasionada por nuestra historia, por las huellas que aún quedan del paso de nuestros antecesores a lo largo de los siglos… y ante todo me has demostrado que no importa la diferencia cultural ni la distancia geográfica… que el Camino puede unir de una forma increiblemente mágica a dos personas y hacer que en ellas nazca una verdadera amistad. Muchas gracias amiga. Tú has hecho esto camino muy especial para mí. Gracias por todos.